A beautiful apartment that is quite spacious with amazing views from the terrace. It is nestled in the hills above Sorrento Center and offers peace and quiet. A short 10-15 minute walk into town. Very comfortable space. I thank you for having loved our house with its landscapes, its colors, its perfumes and its delicious lemons. A beautiful apartment spacious and well equipped with an amazing view from the terrace. Kitchen had everything I needed and I enjoyed making meals with the delicious local ingredients. Thank you for the lemons that were fresh from the tree in the garden. This is a lovely, spacious, airy, cool and meticulously clean apartment with stunning views. We had a wonderful time using this as our base for investigating the beautiful winding streets of Sorrento but also using public transport to get to the ruins at Pompeii, go up Vesuvius and look into its crater but also around the idyllic coast of Almalfi and Positano. The walk down (and therefore up on your return) into Sorrento old town is one for the mobility able only and beware of the pedestrian crossing at the bottom - they do not stop even when you are on the crossing - a quick trip to the nearby hospital was required when a car knocked me off my feet when using this crossing. However the supermarket is the last shop before the assent back to the apartment for carrying groceries and water and the view from the balcony of the twinkling lights of the Bay of Naples with Vesuvius as it’s backdrop and stunning the sunsets and the slices of sweet lemon from the garden’s very own lemon groves in your aperitif makes the sweat worth it!! We’ve returned home with lovely memories. Thank you for the beautiful things you have appreciated of our beautiful land. The colors, the perfumes and the flavors that you bring with you are a pride for us. This is what makes us love and remember our guests with affection. We had such a lovely stay in this apartment. Mrs. Olga and Mr. Franco were very warm and helpful upon our arrival... particularly assisting with finding parking for our car. There really is no "off street parking" available, as stated in the description, unless you drive a motorcycle. We ended up spending an additional 120 euros for parking over the week. Still, loved the location high over Sorrento and the nice ten minute hike up to get to the apartment, and the balcony with its amazing views and citrus trees below. Thank you for sharing your home with us. I am very happy that you have spent happy days in our home. Sharing with kind, loving and friendly people like you have been is always a great pleasure. Everything we expected; close walk to all Sorrento has to offer! If you can walk the short, 5-minute climb up, this wonderful apartment will be your reward. Nestled in the hills right above Sorrento center, this 3-bedroom has much to offer including peace and quiet just steps from the city center. 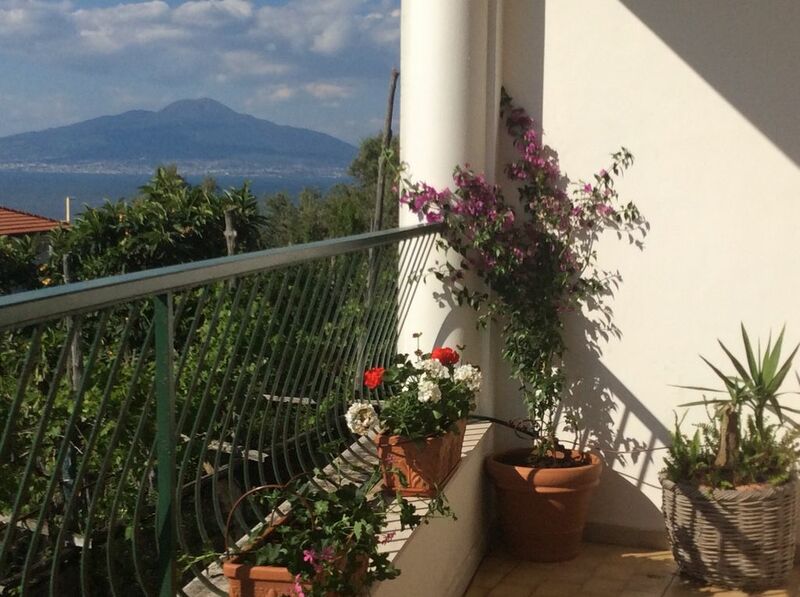 The highlight, was its wonderful balcony with a special view of the bay and Mount Vesuvius. After a couple of days it felt like our European home away from home and Sorrento my ideal place to discover the natural beauty of the Amalfi coast. Pluses: the balcony, the second, smaller bathroom w outdoor shower & hot water, Mrs Olga and her husband who live downstairs and greet you upon arrival, tall ceilings, huge windows that allow air flow throughout apartment, the lemon trees/garden surrounding most of building, no surprises in price as it includes everything! Minuses: Access to onsight parking very limited as car needs to be miniscule or it won’t fit through extremely narrow street (but we found street parking relatively easy if you can park in a hill), the neighbours’ guard dogs that will greet you everytime you leave or return to the apartment (they are well fenced in but are menacing even for someone who loves dogs).